Lindsay here on a beautiful Saturday in Korea. A sunny, cold day perfect for shuttle lift-off. Though there are no shuttles shooting into space today (that I know of), there will be one in April carrying the first Korean to space….with his kimchi. Several Korean meals are ready to go with Korea’s first astronaut in April, with the dishes receiving the go sign from the Russian space authorities. The Korea Atomic Energy Research Institute said Tuesday that it recently received certificates from the State Scientific Center of the Russian Federation for four types of food. 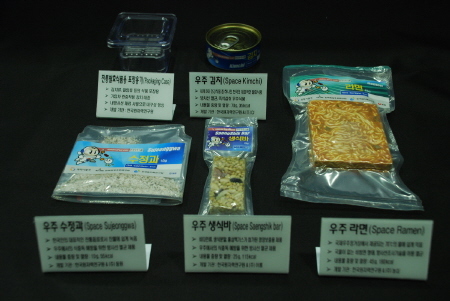 The Korea Food Research Institute is also developing six other menu items for the space trip. The astronaut, Ko San, will eat kimchi, bean soup, rice and instant noodles as main dishes. Then he will be able to cleanse his palate with ginseng tea or sujeonggwa (cinnamon punch).With the certificates, Korea has become the only nation outside Russia and the United States to provide food for its astronauts, the atomic energy institute said. Currently, there are 157 items certified as space food, it said. Eating in space is a tricky task, because the lack of gravity makes it difficult to use cutlery and swallow liquid without the use of a straw. Space food must be engineered to be light, well packaged, quick to serve and easy to clean up. “Bread crumbs can damage the equipment because it is hard to collect them if they are left floating in the closed room,” Ko said at a press meeting in December. “So most space foods are wrapped in plastic bags or in tubes,” he said, adding that he enjoyed eating them. The atomic energy agency first tried to pack kimchi in a vacuum bag, but made a last-minute change to have it contained in a metal can. Ko, a 30-year-old computer scientist, will fly to the International Space Station in April on a Russian Soyuz rocket. He is to stay seven to eight days conducting various scientific experiments.